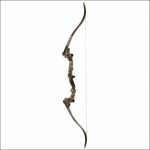 Cabela’s Thundor Recurve is a 66″ budget-friendly bow that combines both strength and performance in a single package. It’s available in 30# and 35# draw weights. The riser is cast-aluminum, and ships only in red. The limbs are white maple and fiberglass laminations, with a very simple design. In terms of design, the Thundor looks like a Samick Sage with an aluminum riser. Let’s take a look at Cabela’s offering and see how well it truly performs. What Comes With Cabela’s Thundor Recurve Bow? No real bells and whistles, but that’s to be expected for a budget recurve. The arrow rest is a stick-on flipper style job, and it’s shaped in an unfortunate way that allows it to catch the arrow’s fletchings, ripping up feathers and damaging vanes. As soon as I noticed this, I replaced the included arrow rest with a stick-on rubber one instead. How Easy Is This Recurve to Assemble? Putting your Thundor together is quite simple, but the packaging doesn’t include a bow stringer. Since I always have one or two lying around, this wasn’t a problem for me, but if you’re purchasing your first bow or otherwise don’t have a stringer, I strongly recommend buying one at the same time. The limbs attach easily to this takedown recurve, using thumb screws so there’s no need for any tools for assembly. I noticed some side to side play of the upper limb when I first attached it, no matter how tight I fastened the thumb screw, but this was easily resolved by reseating the piece in its pocket. What Accessories Will Work With the Thundor? The riser is configured with holes for a sight, plunger, and stabilizer. It’s worth noting, though, that if you replace the arrow rest, you might have to trim it back some if you’re also using a plunger with the recurve. Cabela’s has drilled the hole a bit too close to where the arrow rest sits, an unfortunate design flaw. Once you have your Thundor assembled and strung, you should go ahead and install whatever accessories you plan to use. I shoot off the shelf without a sight, instinctive shooting, but if you’re a beginner, it’s often wise to at least install a sight. Once you have your accessories in place, you can move on to the process of tuning your archery equipment. How’s the Power and Accuracy of the Bow? You’ve got two choices for draw weight here: 30# and 35#. Not exactly the greatest selection in the world, and those weights might preclude young beginners from using the Thundor, but it’s definitely a great beginning point for older youth and adults who are just getting started. Not sure which draw weight is right for you? Check out ourguide on selecting the right draw weight for some assistance. Accuracy-wise, this is a fine piece of equipment. It shoots consistently straight, and is forgiving of even the most green of beginning archers. I was able to maintain 3-inch groupings from 40 yards without any problem, and I enjoyed every minute of shooting the bow. Is Cabela’s Thundor Recurve Suitable for Hunting? Technically, the Thundor might be powerful enough for small game hunting, but it certainly isn’t appropriate for medium- to larger-sized game like deer, elk, or the like. Many states require your archery equipment to have a minimum draw weight of 40# for deer and larger, and the Thundor isn’t available with that much power. I wouldn’t recommend this particular recurve for hunting purposes; it’s primarily designed for target shooting. Assuming you’re a beginner with the size and strength to pull a 30# or 35# bow, the Thundor is quite friendly for novice archers. It is forgiving of poor technique and stance, so an amateur can enjoy accurate shooting even as he or she learns the craft. Since the recurve is drilled for accessories, a sight can be installed for even more help with accuracy. What Are The Best Arrows To Use With The Bow? Choosing arrows is mostly a personal decision, but you should have a look at our guide on arrow selection before you make your final selection. Remember that you’ll use different arrows and broadheads or tips for target practice than you would for hunting rabbits or squirrels. How Durable Are The Thundor’s Limbs And Riser? The limbs and riser appear to be quite rugged, and the bow is designed for amateur archers who are often nervous and anxious about shooting in the first place, which can make them a bit less than cautious. Since this model is a takedown recurve, it’s easy to prevent limb twist – just disassemble your archery equipment when you’re done using it for the day. The string was a bit of a disappointment, in that the center serving began to unravel quite soon. If you have someone trained in tuning a bow, the serving can be easily replaced when this happens. It’s simply an annoyance that it would some apart so quickly. What Strings Will Fit This Recurve Bow? The limb tips on the Thundor do not appear to be reinforced, so you should not attempt using Flemish or Fastflight strings with the bow. Any Dacron bowstring will work just fine, though. Since Cabela’s Thundor utilizes an aluminum riser, the manufacturer was able to keep the weight down considerably on this model. It weighs in at just 2.75 pounds, and is very easy to maneuver and handle. This particular archery equipment wasn’t designed to be quiet, so it isn’t. There are definitely louder models out there, but you still shouldn’t expect the Thundor to rival more expensive bows in terms of quietness. String silencers do bring the noise down, but this particular recurve isn’t meant to be a silent, deadly killer of game. 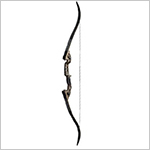 Thanks for checking our review of Cabela’s Thundor recurve bow. This is a great example of a beginner’s model, and is terrific for target shooting. You won’t be doing any hunting with this archery equipment, but it will certainly help you build your form and technique. 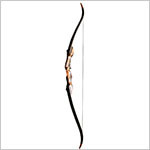 Take a look at current price on the Cabela’s Thundor Recurve Bow if you’re interested in buying.